These official high grade ID Card kits are kits you assemble yourself! It uses a Passport sized photo and comes with complete instructions, a pocket clip (so you can wear on your shirt pocket or belt), a neck chain (which makes them multi-fuctional), a laminate, a self adhesive foil hologram and a template to size the photo for authentic appearance. It also has Bright Red graphics on a Shaded background and measures 4 1/2-inches X 3-inches (Folio size). You can even obtain a high grade soft leather folio flash-display case for your high grade hologram official ID. These special grade ID Hologram ID cards give you multi-functional display ability. You can display them on your shirt pocket or belt. You can use the neck chain to wear them arond your neck and you can insert them into the high grade soft leather hand made flash carry case. This Private Investigator ID Card kit is a kit you assemble yourself! It uses a Passport sized photo and comes with complete instructions, an A08 Pocket Clip, a Laminate, a Self Adhesive Foil Hologram and a Template to size the photo for authentic appearance. It also has Bright Yellow Letters on a Black Panel and a Shaded Yellow background and measures 4 1/2-inches X 3-inches (Folio size). This Process Server ID Card kit is a kit you assemble yourself! It uses a Passport sized photo and comes with complete instructions, an A08 Pocket Clip, a Laminate, a Self Adhesive Foil Hologram and a Template to size the photo for authentic appearance. It also has Bright Orange Letters on a Shaded Yellow background and measures 4 1/2-inches X 3-inches (Folio size). This Executive Security ID Card kit is a kit you assemble yourself! It uses a Passport sized photo and comes with complete instructions, an A08 Pocket Clip, a Laminate, a Self Adhesive Foil Hologram and a Template to size the photo for authentic appearance. It also has Bright Yellow Letters on a Black Panel and measures 4 1/2-inches X 3-inches (Folio size). This Official Security ID Card kit is a kit you assemble yourself! It uses a Passport sized photo and comes with complete instructions, an A08 Pocket Clip, a Laminate, a Self Adhesive Foil Hologram and a Template to size the photo for authentic appearance. It also has Bright Red graphics on a Shaded Grey background and measures 4 1/2-inches X 3-inches (Folio size). 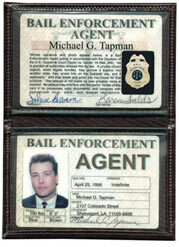 This Bail Enforcement ID Card kit is a kit you assemble yourself! It uses a Passport sized photo and comes with complete instructions, an A08 Pocket Clip, a Laminate, a Self Adhesive Foil Hologram and a Template to size the photo for authentic appearance. It also has Bright Yellow Letters on a Black Panel and a Shaded Yellow background and measures 4 1/2-inches X 3-inches (Folio size). This APA (American Press Association) Press ID Card kit is a kit you assemble yourself! It uses a Passport sized photo and comes with complete instructions, an A08 Pocket Clip, a Laminate, a Self Adhesive Foil Hologram and a Template to size the photo for authentic appearance. It also has Deep Grey graphics on a Shaded Blue background and measures 4 1/2-inches X 3-inches (Folio size). In our search for professional ways to carry credentials that meet our specifications for quality and value, we've located several new and useful designs. One of these great new cases is this leather soft Federal folio ID case. This folio case is used most often with our F-series and Premium F-200-series credentials and has quickly become a fast seller. With this Federal ID case, you also have your style choice between a leather soft brown or black case that comes with or without a standard sized badge flap that can hold most badges. The windows measure 4 3/8-inches X 2 5/8-inches and this case is guaranteed to give the user years of trouble free service. Order yours today! Shipping is Only $1.00 On ID Cards.